The presence of police in schools has escalated dramatically in the last several decades, and the figures on arrests and referrals to law enforcement show disproportionate targeting of Black and Latino students. This is just one aspect of the school-to-prison pipeline, where some students are denied an opportunity to succeed, and instead are pushed out of school and into the juvenile or criminal justice system. While the complete emotional, social and financial impact of daily police presence in schools is not fully understood, it is clear that students and their families are criminalized, and that school-based arrests and referrals to law enforcement go up when police have a regular presence in schools. On October 25, 2018, as part of the National Week of Action Against School Pushout, DSC released an updated set of resources from our Model Code on Education & Dignity. 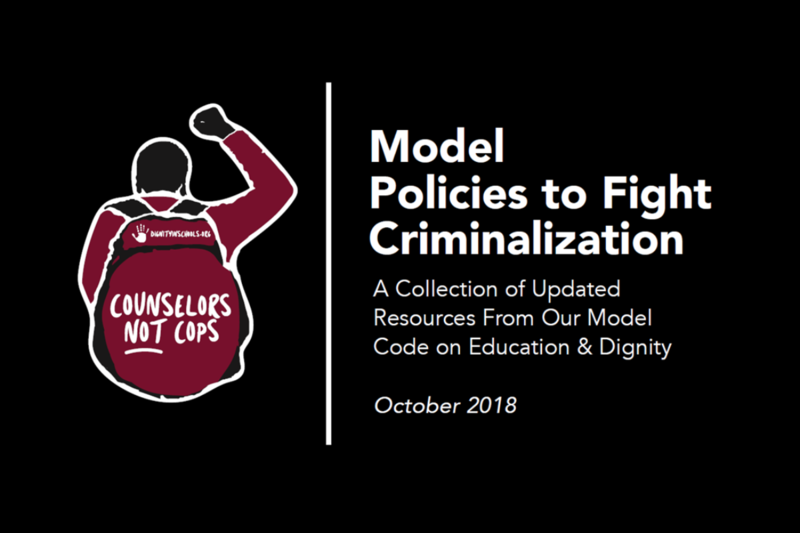 These resources provide recommendations for schools, districts, states and federal policy-makers to end the regular presence of law enforcement in schools and end the criminalization of students. They are based on best practices, research and experiences of students, parents, intervention workers, peace-builders and educators from around the country, and on a human rights framework for schools. They are designed so that communities and policy-makers can identify specific areas of concern and implement the recommended language, including changing laws and policies, while taking into account the diverse needs and characteristics of individual communities. DSC is continuing to work on additional updates and additions to the Model Code and will release a complete updated version in 2019. The Dignity in Schools Campaign’s Model School Code on Education & Dignity presents a set of recommended policies to schools, districts and legislators to help end school pushout and protect the human rights to education, dignity, participation and freedom from discrimination. The Code is the culmination of several years of research and dialogue with students, parents, educators, advocates and researchers who came together to envision a school system that supports all children and young people in reaching their full potential. In October 2013, DSC released a new revised version of the Model Code, which includes new sections on: social and emotional learning, prevention and response to bullying behavior, reducing tickets and summonses issued in school, reducing racial disparities in discipline through culturally responsive classroom management, creating safe schools for LGBTQ students and other topics. Read the Model Code Executive Summary. Read the full Model Code. Read the Model Code Comparison Tool. Read “How Do We Make Schools Safer?” an article by Natalie Chap and Liz Sullivan on the policies suggested in the Model Code as positive and proven alternatives to policies that call for implementing a “law enforcement” approach to school safety and discipline.